Look for more on this later -- but I wanted to let you all know that L.A. Live is offering a lot of discounts for many of its businesses (Starbucks, Katsuya, Trader Vic's) for those that live in area codes 90012, 90013, 90014, 90015, 90017, 90021, and 90071. You must show proof of residency to be eligible for these deals. I was searching around for some new gluten free products at my local Ralph's today, and I happened upon Lundberg's Risotto. The box called out to me with "Gluten Free" in large lettering on its front. Of course, the true test comes in the kitchen. I'm not a chef by any stretch of the imagination, but the directions were very simple: sautée the rice, add water, add the seasoning packet, and let simmer for about 20 minutes. The directions were easy enough for even me to follow, and the result was delicious! I would recommend adding some parmesan cheese to perfect it. I really liked Lundberg's Risotto. The brand also makes rice cakes, rice, and rice chips, and other products. Lundberg is based here in California in the Sacramento Valley. 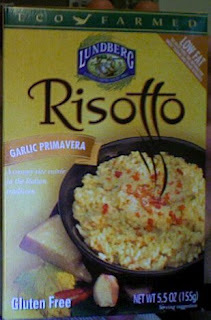 Please note that the Eco-Farmed risottos are marked gluten free; the organic risottos are not marked gluten free. 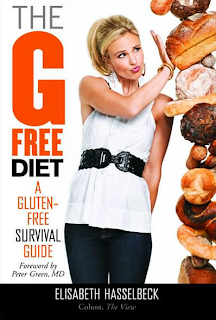 Today on "The View," Celiac author Elisabeth Hasselbeck responded to allegations that she plagiarized another author's book in writing her book, "The G-Free Diet." Check out her respond to the charges here. My previous post on concerns from the Celiac community concerning Hasselbeck's book can be found here. Hasselbeck's appearance on Sean Hannity plugging her book can be found here. See my previous post on the plagiarism charge here. A reader recently told me about Fresh Brothers, a South Bay pizza establishment with locations in Manhattan and Redondo Beaches. Fresh Brothers offers an extensive gluten free menu including pizzas, salads, and wings. I've been meaning to get down to Fresh Brothers for a long time and I finally made the trip down to Manhattan Beach this weekend. What better time to visit the South Bay then the first beautiful June day? I'm new to L.A. and was not expecting June Gloom at all, so I'm relieved that we seem to be reaching the end of it. When I saw the sun shining in through my patio window, I knew today was the day to get down to Manhattan Beach, pick up a pizza, and hit the beach. I called before I left my apartment, ordering a Fresh Momma's Favorite with sliced mozzarella. 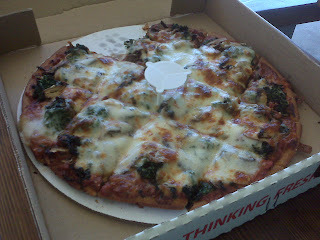 The Fresh Momma's favorite includes mushrooms, spinach, and a blend of pizza and pesto sauce. After battling a bit of traffic on the 405, I arrived at Fresh Brothers sufficiently hungry. I was certainly not disappointed by the portions! The gluten free pizza is only available in one size, and as you can see from the above picture it is quite a large size! It is a circular pie with 16 slices cut into it. I sat down at a table in the restaurant and had a slice or two before departing to the beach. Wow! The pizza is great. Normally when I eat gluten free pizza the crust is paper thin; not so with Fresh Brothers' gluten free pizza, which is thicker than most gluten free pizzas. Admittedly, the pizza is not thick and fluffy like the Domino's pizzas I remember from my youth, but that is an effect of it being gluten free. The pizza at Fresh Brothers is terrific. Another great feature: the price! The large pizza was only $20, and if I hadn't added the sliced mozzarella it would have been even cheaper. While that may be more than Pizza Hut (or "The Hut" as they are now marketing it) and Domino's, the cost of gluten free baking products is certainly higher and the ingredients used at Fresh Brothers are fresher (I wonder where they got the name from?). I noticed while I was in the shop that there were cookies available too. After speaking with one of the owners of the restaurant, I was informed of two big pieces of Fresh Brothers news. 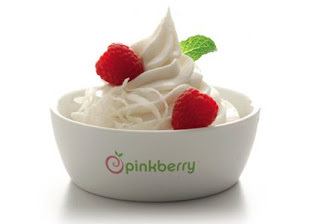 The restaurant will soon be offering gluten free desserts in addition to their salads, wings, and pizza. More importantly, Fresh Brothers is planning on opening up a location in L.A.'s Westside before 2009 ends! I'm very excited to have a Fresh Brothers closer to me as it is the best gluten free pizza I've had in Los Angeles. Follow Fresh Brothers on Twitter here. Follow me on Twitter here. I'm excited to introduce a new feature to Gluten Freeway L.A. If you look in the right column, beneath the facebook image, there is now a link that reads "Gluten Freeway LA's Calendar." 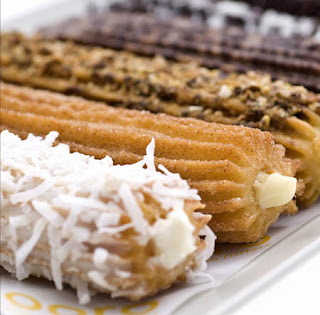 After posting about Xooro's opening party (here), I realized that I should make it easy for you to see sales, events, or any other notable gluten free dates. I hope you enjoy using the feature and that it proves useful and easy to use. Thank you for reading and sending me your tips, comments, and feedback. I appreciate each and every time a user contacts me (even with criticism)! I know I'm a bit behind this curve, but Chex has released a few new gluten free flavors just in time for the summer. The first flavor I noticed at my local grocery store was Corn Chex. 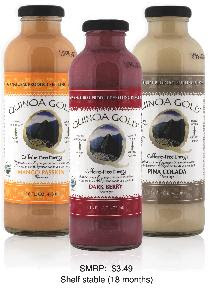 The new boxes are marked "Gluten Free" in large lettering (see the below photo for an example). I neglected to pick up a box of Corn Chex and instead stuck with my tried and true favorite Rice Chex. However, when I saw Honey Nut Chex on display at my local Ralph's I jumped on the chance to try the new flavor. 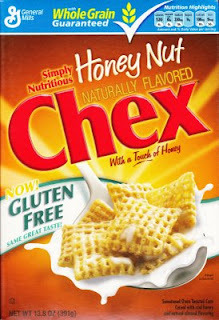 I was certainly not disappointed -- Honey Nut Chex is a welcome break from the regularity of Rice Chex. The cereal is delicious and is a whole grain cereal with 10% of your daily calcium requirements in each serving. However, it also contains 230mg of Sodium per serving. I have yet to see other flavors marked gluten free on the shelves yet, but according to Chex's official website the following flavors will be gluten free and marked as such: Rice, Corn, Honey Nut, Chocolate, Cinnamon, Strawberry. No, you have not ventured into an R-rated site. I just had my first Pink Taco experience and am happy to report that it was a positive one. 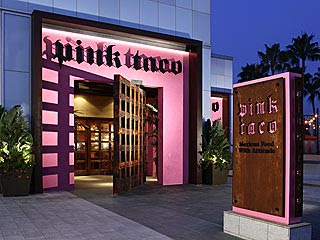 I rounded up a bunch of us rising second year law students to enjoy a happy hour at Pink Taco's Century City location. I'd been hearing about this place since I moved to L.A. last August and now that I finally have a life again I knew it was time to check out what everybody was talking about. I was mostly surprised by the quality. We started off with some guacamole and chips, which were both delicious (and gluten free, as I was told). Of course, check about cross contamination if you are concerned about the chips, as they may be fried in a common fryer. Then we moved on to the real reason we were there -- for the happy hour drinks! Pitchers of margaritas were only $15 from 3pm-7pm. The sun was shining, there was excessive alcohol, and all of us were beaming with happiness that we finished our first year (and survived!). All in all, a great time. After a few drinks my friend Hilary told me she was going to order the Sabana de Pollo and that I should try it before ordering my own. When it came out, I was shocked -- the dish was enormous! She graciously let me split it with her, and it was then that I fell in love with Pink Taco. The dish tasted like pizza, or at least what I remember of wheat-filled pizza. The chicken acted as the crust, albeit chewier than most crusts I remembered. The dish was delicious -- thanks Hilary for guiding me on my first Pink Taco trip! You can check out the menu for yourself here. The one facet that was surprisingly bad was the service. After my roommate and I yelled, in unison, for a waitress she still did not respond to our requests to place an order. I had to walk over to the bar and ask her to come back to our table so we could place an order. Yes, of course, it was happy hour, but we had a table of at least 10 people and were ringing up a large tab, so we expected better service. I guess she knew that the gratuity would be added on no matter how she treated us. I tweeted Pink Taco before going, and they assured me that the staff would be helpful about choosing GF options. I did ask about the Sabana de Pollo and was told I was in the clear; however I did not ask more extensively. Maybe the bad service was because I was in a big group -- regardless, I will certainly be checking out Pink Taco again and sampling more of the gluten free options available. You can follow Pink Taco on Twitter here. You can follow Gluten Freeway LA on Twitter here. I just had a great time at an early screening of the upcoming film "Julie & Julia," starring Meryl Streep and Amy Adams. With a little bit of sweet talk I was able to get myself into the screening and was not disappointed. 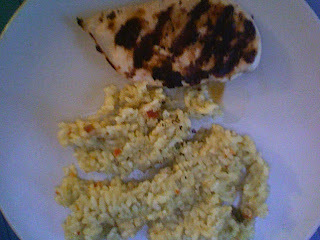 I think, after reading my blog, you can agree that I love to eat! This movie is all about food -- how to prepare it, eating it, writing about it, discussing it, debating it. It's a completely food-centric movie so for all you foodies out there you will love it. The movie is about a woman, Julie, who is a 30 year old wannabe writer working at a dead-end job in Manhattan. She lives in Queens with her husband above a pizza place. After her friend starts a blog she is inspired to start her own, and decides to cook all 524 recipes in Julia Child's cookbook within 365 days. Amy Adams stars as Julie, a woman clearly unhappy at her job who is immediately wrapped up in the adventure of blogging and trying all of Julia's different recipes. 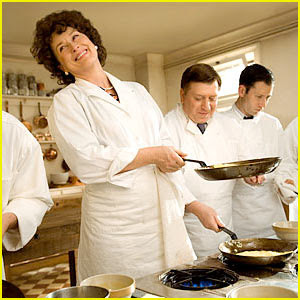 Concurrent to Julie's storyline is Julia Child's own story of how she came to be, well, the Julia Child. Meryl Streep brings Julia Child to life in a way that no other actress could -- her affect, her gait, her joie de vivre is all intact. Stanley Tucci, who previously co-starred with Streep in "The Devil Wears Prada," here plays her husband. The film impressively blends the highs and lows of the two women's lives without having the effect be jarring. 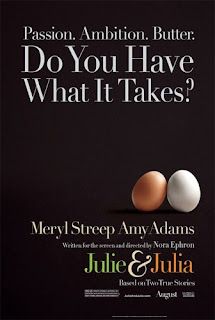 Streep perfectly imbues Julia with appropriate emotions through the highs and lows of her career (her start at Le Cordon Bleu, and her onion-filled night thereafter, was a particularly engaging sequence). Amy Adams as Julie connected with the audience, and she played her character well as somebody who quickly became consumed with a fun idea that turned into a responsibility. Julie has her own highs and lows throughout the movie and Adams conveyed her emotions excellently. Stanley Tucci as Julia's husband was terrific, but it was truly Streep's film as her pitch-perfect performance as Julia really stole the show. I did, however, also enjoy the snotty French woman who ran Le Cordon Bleu and told Julia that she had no real talent as a chef. Ha! I think we all know who had the last laugh. I'm trying to keep my description pretty vague and not say much (because I know I'm not supposed to), but the film was terrific. From start to finish I enjoyed it; if I had one criticism it would be that the ending is a bit abrupt and left me wanting to know how these stories continued. There was a bit of a "Star Wars" scrolling information after the film, but the information provided was the bare minimum. Most importantly for us foodies -- the food! The food was shot lovingly by Nora Ephron (of "You've Got Mail" and "Sleepless in Seattle" fame). While many of the recipes featured in the film were not gluten free (I was drooling over the bread Julie made in one of the beginning scenes), but the ones that are look absolutely scrumptious. This movie is amazing for both foodies and non-foodies alike. The story of how Julia Child came to be published and the story of an upstart blogger gaining fame showed interesting parallels to the way things used to be done back in Julia Child's time and how publishing discovers its hot properties now. The movie will be released on August 7, 2009 nationwide.